In a comprehensive calculation, you want it to be easier to identify as to which values are a result of formulas and which data has been entered. Besides, you want to quickly verify, how formatting the formulas aff ect the results. The editing toolbar shows the formula saved in the active cell. If you want excel to display all formulas of a worksheet at the same time, open ‘Tools | Formula Auditing | Formula Auditing Mode’. This mode can also be activated using the key combination [Ctrl]+[`], which can also help you switch back to the normal view. To be able to check all calculations effectively you will need to view the formulas and their results at the same time. For that, you use two windows one below the other with a view of the same calculation. Close all still open worksheets. Keep the cursor at the beginning of the current table and open ‘Window | New Window’. To arrange both views, select the ‘Window | Compare Side by Side with…’. 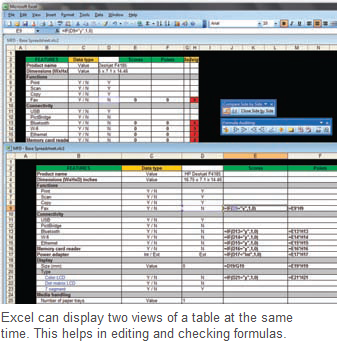 In Excel 2007, switch to the Ribbon ‘View’ and click on ‘New Window’ and ‘Arrange all’. Select the option ‘Horizontal’ and confirm with ‘OK’. Then click on the button ‘Compare side by side with’. Then click in one of the two display windows and press the key combination [Ctrl]+[`], to display the formulas there. Every action in a Window is automatically visible in the adjacent window so that you can always compare the same section. To control the action, you can activate or deactivate the scrolling of the other table in the displayed toolbar ‘Compare side by side with’ using the button ‘Synchronous scrolling’. Editing of values or formulas is possible in both windows. CAUTION: As far as possible, do not close the checking ‘Close side by side’. This changes the window arrangement, but leaves the second window open. It is better to close one of the two windows, so that the original worksheet is viewable in full size again. Then save the changed data, since you have only closed the viewing copy till now.